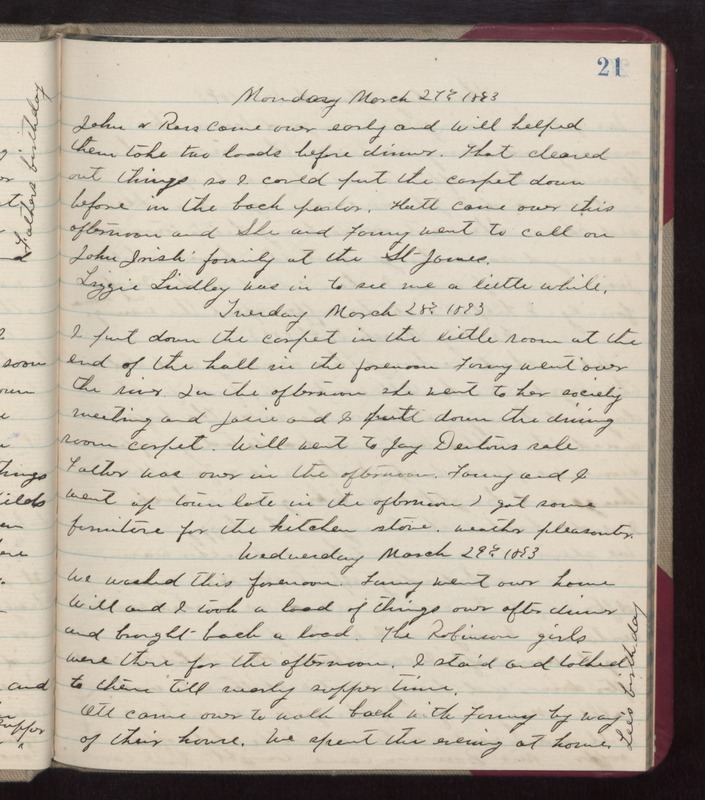 Monday March 27th 1893 John & Ross came over early and Will helped them take two loads before dinner. That cleared out things so I could put the carpet down before in the back parlor. Hatt came over this afternoon and She and Fanny went to call on John Irish family at the St James. Lizzie Lindley was in to see me a little while. Tuesday March 28th 1893 I put down the carpet in the little room at the end of the hall in the forenoon. Fanny went over the river. In the afternoon she went to her society meeting and Josie and I put down the dining room carpet. Will went to Jay Dentons sale. Father was over in the afternoon. Fanny and I went up town late in the afternoon. I got some furniture for the kitchen stove. weather pleasanter. Wednesday March 29th 1893 We washed this forenoon. Fanny went over home. Will and I took a load of things over after dinner and brought back a load. The Robinson girls were there for the afternoon. I staid and talked to them till nearly supper time. Ott came over to walk back with Fanny by way of their house. We spent the evening at home. Lee's birthday.